Games aside, in terms of progress and growth, there has been a lot more incentives recently for the boy to eat his vegetables. I created a sticker board for him to collect stickers for the different things that he does at home – these being things that he usually hates doing: using the potty, eating vegetables, keeping his toys and finishing his meals. If he collects enough stickers for each activity that he does, he would be able to get a coin and the value of the coin will, of course, match the difficulty of the activity. I know very well that this is based off extrinsic motivation, but hey, it’s working, and he’s volunteering to eat his vegetables now! So the implication that follows is that I’m able to cook more dishes with vegetables nowadays. This dish is one of those recipes that I can get to try without much worries about the boy rejecting his food. The asparagus was soft enough such that he wouldn’t have any issues chewing it and biting it off (not too stemy or fibrous like the huge ones). The citrus flavour made the spaghetti taste very refreshing too. We all loved it; you must try it! Heat butter and oil in frying pan. Add leeks and fry for 5min till soft. 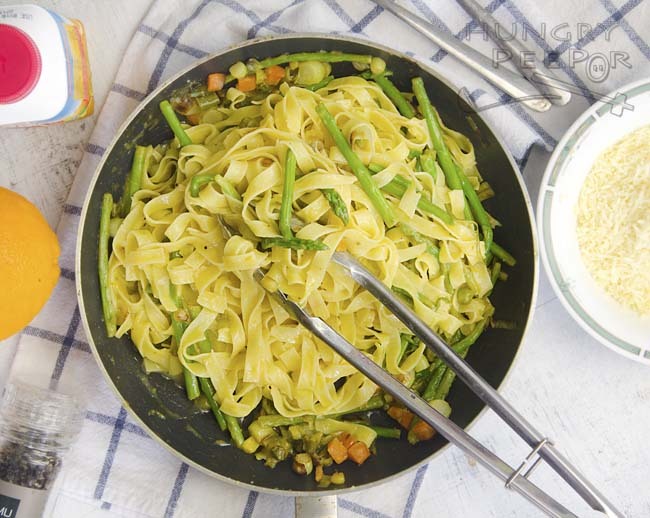 In the meantime, cook tagliatelle in boiling water. Stir mixed vegetables and asparagus into the pan. Cover with lid and leave to cook for 5min till asparagus softens slightly. Add flour and stir continuously for 1min. Add in orange rind and orange juices. Return sauce to boiling and stir till thickened. Drain tagliatelle and add this into the orange mixture. Add salt and pepper to taste. Toss mixture to coat evenly. 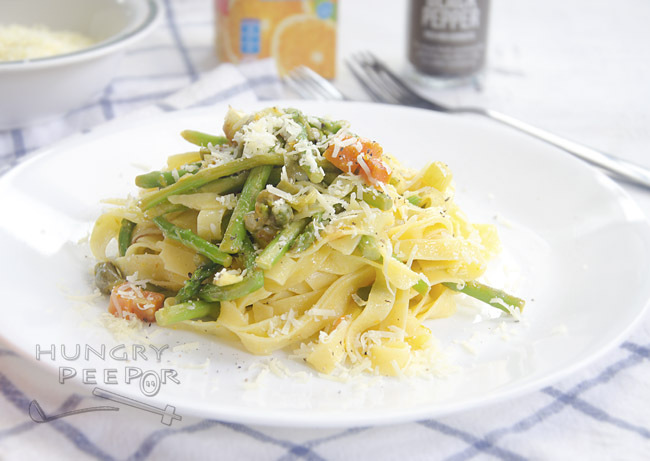 Substitute tagliatelle with fettucine (thinner) or pappardelle (thicker) for a different texture and experience. 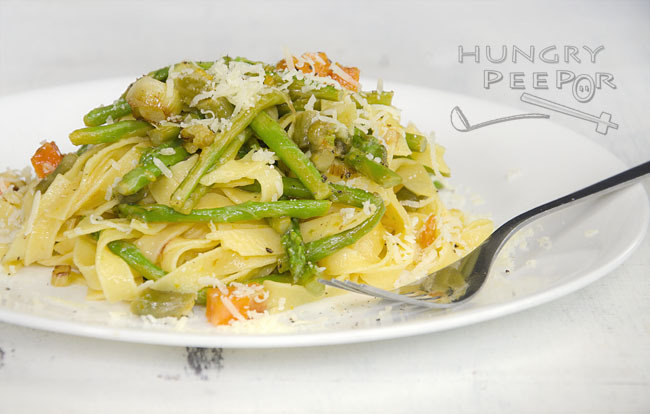 This entry was posted in Italian, Pasta and tagged Asparagus, Orange, Pan-fry, Tagliatelle. Bookmark the permalink.